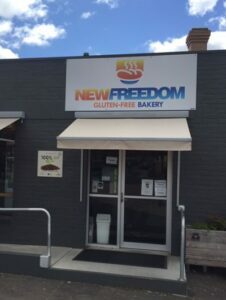 Years ago I heard good things about the bread from New Freedom Bakery in Bendigo, and I finally got to visit and sample it for myself – it was worth the wait! The bread is as close as you will get to ‘normal’ – more on that shortly. For visitors that many not be aware, Bendigo is around a two hour drive from Melbourne. It has a gold rush history and some lovely old buildings and is definitely worth a stop if you are driving around Victoria. Many people from Melbourne travel to Bendigo to visit the gallery that holds some world class exhibitions. 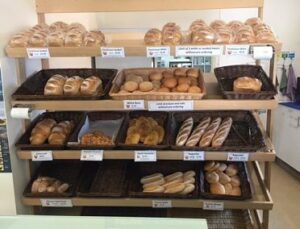 The bakery is in the city centre, just slightly off ‘the beaten track’, but walking distance from the main shopping area or gallery. 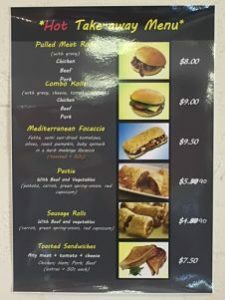 You can eat in or takeaway, with a selection of rolls, fresh or toasted sandwiches, savoury items (eg pastie, sausage roll) and of course a wide variety of sweet options. 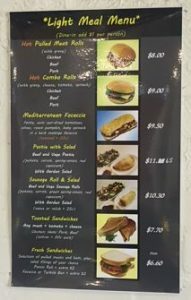 The menu options are shown below. 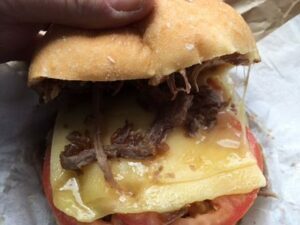 I had a beef pulled roll, which comes with gravy, but I also added cheese and tomato to make it a bit more filling after a long drive from Melbourne. If I hadn’t known it was a 100% gluten free bakery, I would have wondered if I had been accidentally provided a normal roll as it was so soft! 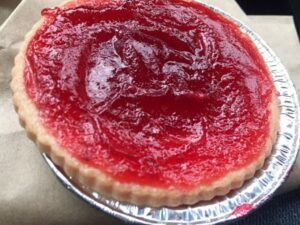 I finished it off with a sweet treat in the form of a jam tart which was also excellent. 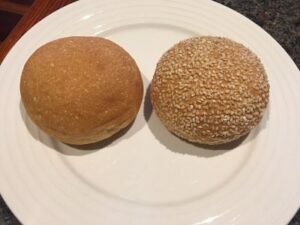 I bought a seeded farmhouse loaf and rolls to take home (I was told they also freeze well). The bread is a very good size for a gluten free loaf. I made a sandwich with it two days later and it was still soft and delicious! This is almost unheard of for gluten free bread, so I am very impressed. 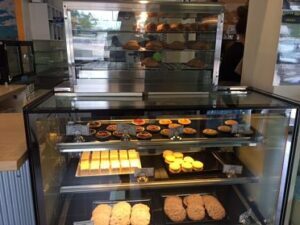 Their website informs us that they use a gluten-free premix called Tru-Dough which has been developed over 17 years and has a 4/5 Health Star rating. It also sold under the brand name ‘FG Roberts Cottage Bread Mix’. The mix is also low GI and FODMAP friendly. If you want to make your own bread, you can order the dry mixes to be sent anywhere in Australia. I also took home some frozen sausage rolls from their freezer section. 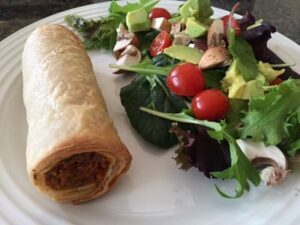 These were another success and both my husband and I thought they were the best gluten free sausage rolls we had ever tasted! 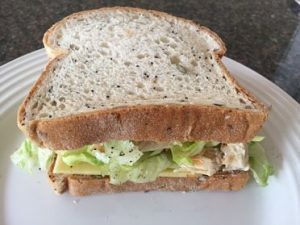 I rarely bother to make my own bread, but after tasting the New Freedom options, I am planning to order the mix – particularly when I need to cater for gluten free, dairy free and low GI at family functions! This post was first published in November 2016 and has had some minor updates since then.